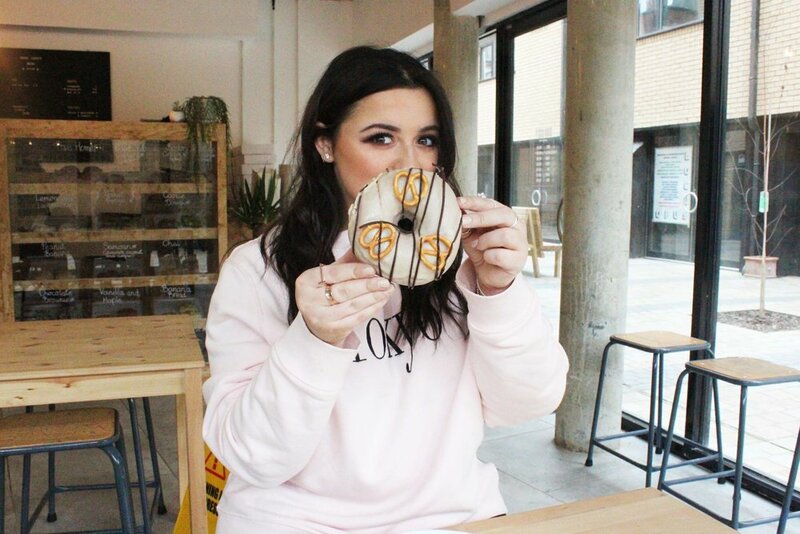 Who doesn't love a doughnut?! 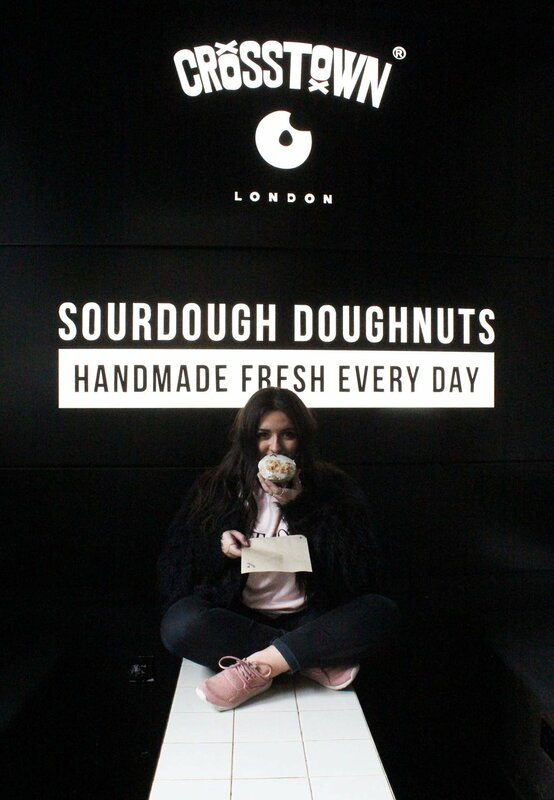 I know I most certainly do - so much in-fact, that I went on a doughnut hunt around London to find the best. Although I am not a vegan, I was curious to find what the alternatives were and if they were any good. I think many people have a stigma against vegan food being bland and not as adventurous. So here we go - let the doughnut tour commence. My first port of call was a little place called Dough Society. 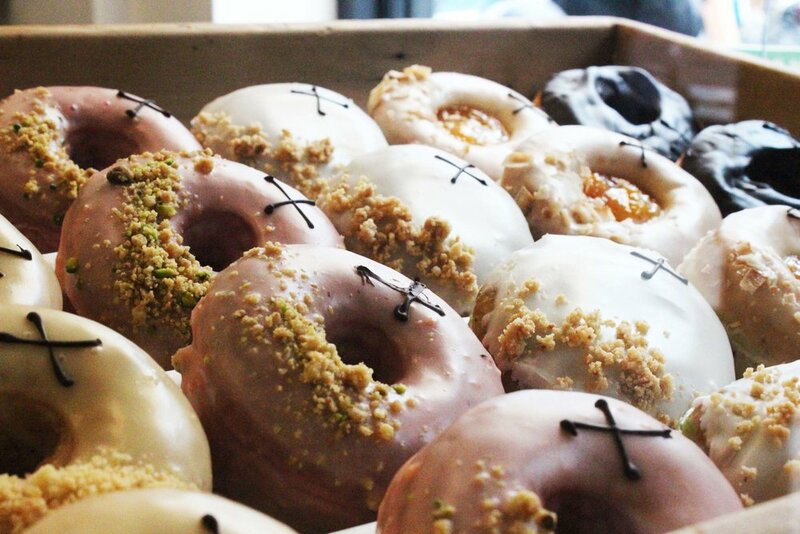 Labelled as the first vegan doughnut shop in London, I knew this is where I would possibly find a great doughnut. Be careful not to miss this little gem, as it's a little hidden, down a small passage off of Hackney High Street. It's industrial asthetic was pleasing and inside there was a massive glass counter filled with different flavours which all sounded incredible. After much discussion, I decided to go for the Peanut Butter Pretzel doughnut, combining both sweet and savoury. It was a standard ring doughnut with a thin peanut butter glaze with pretzels on the top, perfect for that added crunch. You defiantly wouldn't know that this doughnut was vegan as it was light a fluffy and the flavours were excellent. Other choices of doughnut included, Chai, Banana Bread, Cookie Dough and Lavender to name a few! They also create some weird and wonderful seasonal flavours, so make sure you don't miss out on some exclusives! If the doughnuts weren't enough to get you there - there's an insta ready wall so you and your squad can get the perfect shot. 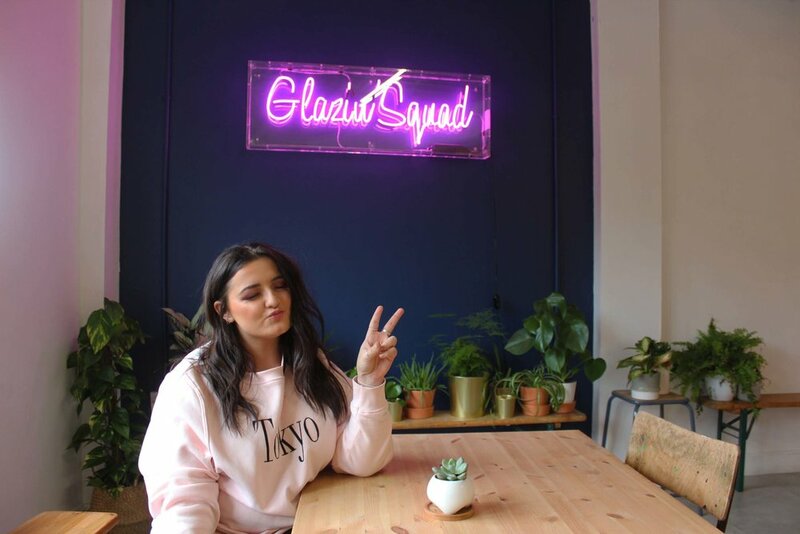 Neon signs + plants = #photogoals. If you haven't heard of Doughnut Time where have you been hiding?! The Aussie brand made its launch in the UK not too long ago and since then it's been blowing up a storm. What make's them stand out is their innovative names for their doughnuts such as The NOTORIOUS P.I.G. (The famous Percy Pig one!) and Stranger Rings 2.0. Admittedly, I have had a selection of their doughnuts before at Winter Wonderland in Hyde Park, but this time I wanted to see how many vegan options there were. I chose to go with two flavours (because i'm indecisive) Sia Later and Houston, We Have Biscoff. Sia Later is a red velvet doughnut with vegan butter cream frosting and frozen raspberries. Literally like eating a slice of heaven! Full of flavour and surprisingly not super sickly. This has got to be an absolute favourite of mine. You can check what flavours are in their shops by visiting their website. They also make a lot of seasonal goodies too! This place isn't hard to find - just look for the turquoise building near Old Street Station! With the recent launch of their first all-vegan doughnut shop in Marylebone, I thought I had better give Crosstown a little visit. If you're in London a lot, you will see these bad boys everywhere, as they are one of the fastest growing doughnut franchises in London. I decided to visit the Brick Lane store to find some vegan goodness. Again, there were a good 5 vegan options and all of the flavours sounded amazing, so I asked the girls behind the counter which was a store favourite. They gave me the Coconut & Lime which has got to be one of the best doughnuts I have ever had. The filling was a thick coconut cream which is naturally sweet, then I got a hit of strong lime which was within the glaze and the dough itself. As well as serving other innovative flavours such as Blood Orange and Tropical, this Crosstown is a great spot for hanging out with friends and drinking delicious coffee. If you're a doughnut lover, I would recommend giving these a try. If you have tried them, I would love to know what you thought. The more doughnuts the merrier, right! ?